The last time I visited Sweden was around 7 years ago when I took a trip with my husband to visit his family. I had only touched down in Stockholm so I knew very little about the country and all it's wonderful delights. This past week, I had the good fortune, of visiting Sweden in both Stockholm as well as Bastad, a city located in southern Sweden, bordering Norway and Denmark. One of my very dear friends got married at the famous Norvikken Gardens and it was a beautiful destination to hold such a wonderful ceremony. Here are my favorite highlights from the trip! Wondering around the beautiful streets of Bastad! A city like no other, Bastad is home to 5,000 residents and is a popular destination during the summer. It is well known for Tennis tournaments and matches and the scenery is beautiful. I remember one sunny day, we strolled around and picked wild cherries right off the tree and they were so sweet! Many places to see near the area are the garden grounds of Norvikken, the national park of Hovs Haller, and take a stroll along the ocean. Overlooking Bastad at Sunset! Rocking my favorite Gal Meets Glam dress I picked up at Nordstrom! The wedding couple picked us up in an old British double decker bus! Im playing around in my favorite Anthropologie dress! Midsummer is a festival held between the dates of June 19-June 25. It celebrates the Summer Solstice, the longest day of the year. It is a place where you make flower crowns, dance around the maypole and party! Traditionally, it is said, that a girl would put 7 different flowers on her pillow and when she sleeps, she dreams of her future husband. Pretty cool! I went during the Midsummer Festival and i learned how to make my own flower crown! Flowers, Flowers, Everywhere! Flower Power in my favorite dress from Target! Girl Talk at the amazing Norvikken Grounds! This is where the wedding took place! WonderTip: When making a reservation here, request a room with an ocean view. It is specatular! A beautiful national park near Bastad. It contains a rocky coastline with beautiful trails to hike and beaches to stroll. I took a day and explored and it was magical. It actually reminded me of the coastline in Big Sur. What a treat! The rocky coastline of Hovs Hallar! Here I am rocking my favorite Banana Republic dress! Stockholm is one my favorite cities in the world because the people are very friendly (not a norm for some European cities). The cobblestone streets are lined with beautiful ochre-colored buildings and the city is surrounded by the water. There are many places to visit in the city but my personal favorite hot-spots include The Vasa Museum, the zoo over at Skansen, and the old city of Gamla Stan. The Vasa Museum is a museum in Stockholm that houses one of the oldest, preserved ships in the world, The Vasa. The story goes the Vasa was set out on her maiden voyage in 1628. The gust of winds blew her onto her port side, allowing water to fill the lower gun decks. The ship eventually sank in the harbor and had only sailed about a half hour before it finally capsized. 30 people perished that day. 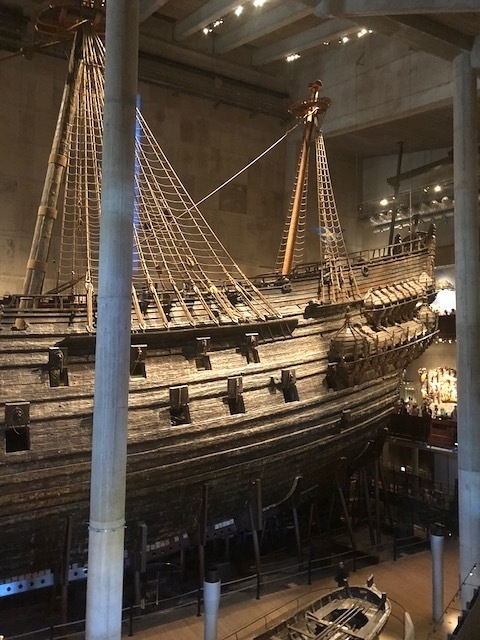 After nearly 333 years, the ship was raised from being underwater and sits in this amazing exhibit! The front of the ship! Skansen is the oldest open air museum in Stockholm and it displays the whole of Sweden with houses and farms from every part of the country. There is a zoo located inside and it features many Nordic animals including the Wolverine, Moose, and some Elk. They also make delicious homemade cinnamon buns that are delicious! Found a peacock inside the zoo in Skansen! The view of the Nordic Museum from Skansen! Rocking my favorite summer dress from Anthropologie! Gamla Stan, the old town in Stockholm, is one if not the most popular tourist destination in Stockholm. There are a ton of beautiful churches, the Nobel Museum, and the Stockholm Cathedral. It also is home to many amazing restaurants and bars and as you stroll around, you feel like you are in a storybook. All of the cobblestone streets and ochre colored buildings are stunning! Blowing kisses in Old Town (Gamla Stan) in my favorite blue outfit from Target! Gamla Stan is so beautiful and decorated with the prettiest architecture! WONDERING: WHERE TO EAT IN STOCKHOLM! *GRODAN: My favorite restaurant in Stockholm because the food is delicious and their menu is extensive! The best item, in my opinion, are the Swedish meatballs with Lingonberries, potatoes, and cucumbers! A native dish to Sweden! Swedish Meatballs, Lingonberries, and Cucumbers!